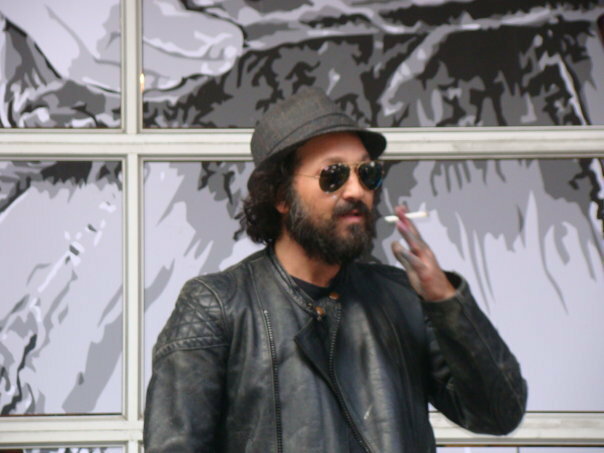 Mr. Brainwash always has paint on his hand. Banksy’s latest assault is Exit Through the Gift Shop, a mockumentary or fauxdoc, perhaps, that alleges to be about one Mr. Brainwash, aka Thierry Guetta, madman filmmaker and god-awful artist. Guetta, is, apparently a nutter who attached himself to the famous street artist, following him (and other notable street artists) around for ten years or so and obtaining enough undesirable footage to force Banksy pay some attention. When he did, the story goes, he turned the camera on Guetta himself and told him to go make his own art.